Umbria is a very spiritual land that each year attracts millions of pilgrims from all over the world. Many of its towns are characterized by a profound religious sentiment, which of course deepens its roots in the Christian Catholic religion. However, the mysticism of Umbria goes beyond religion. This is the land where St. Francis of Assisi was born and that has remained under the power of the Vatican state up until the unity of Italy. Therefore when you travel through Umbria you will see many signs of these religious signs. Of course a visit to Assisi is a must. And even though you may not be a person of faith, just to see the impressive abbey dedicated to the Saint will take your breath. But of course the entire region abounds with wonderful churches and spiritual places. 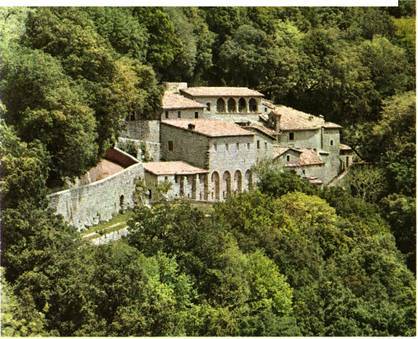 A famous place of such importance is Monteluco in the province of Perugia near Spoleto. St. Francis found this place to retire himself in prayer. He obtained to pray in the chapel of St. Catherine that used to belong to the hermit monks of Monteluco. Nowadays in this place you have a Franciscan sanctuary surrounded by a deep Oak woods that is called the "sacred woods" and covers up the Monteluco. You should really go and see the church dedicated to St. Francis and St. Catherine. The place is still preserving the tiny cells and the stone that the St. used as his bed. Also, still intact, are the caves where some of the Saints stayed for a period. Lastly you should enjoy the wonderful view of Spoleto from here. Another important spiritual place to visit is the small Hermitage of Carceri, only 5 km away from Assisi, along the way that leads to mount Subasio. Here you will find a small chapel, some grottoes, and some refuge that the St. and his followers have used since 1205 to pray and contemplate.